So I might be crazy, but I'm listening to this right now on headphones and it sounds as if there is a whole other backing track for it embedded very, very low in the mix. It sounds like the plaintive guitar line that comprises this instrumental is an isolated studio track from an actual, more full-fledged song. In the last few seconds if you turn it way up on a good pair of headphones, you can hear some kind of peripheral song bleeding through, I DEFINITELY hear a female voice at the very end. Maybe another song was playing in the studio at the time of the recording? In any case, I really like this little ditty, a very poignant progression that I wish she did something more with. Or maybe she did, and we just have never heard it. Hmm, you're not crazy, there definitely is something going on there right at the end. Speaking of B-sides to The Wind, Rebecca has always been one of my favorite PJ B-sides. Try that one in headphones with the volume way up. Never realized it was that trippy. I can hear that peripheral song in my left headphone, but it seems to have different tempo, so I suppouse this is just some ambient sounds in the studio. I'll have to check it out, but sometimes tape "bleeds" through, typically at the end of a song. The next song transfers to the outer adjacent tape on the reel. Hmm, it sounds like Mansize, sort of. It goes on for some time too, another possibility is that the tape wasn't completely erased. At any rate, I think it's a tape issue. After listening to this b-side for many years, wondering what all that extra stuff was in the background, I concluded it was "Send His Love to Me", the percussion seems to be the same, and after reading soulfadelic's post and turning it up with headphones, I feel like I can hear the same chord progression at the end of the song. So ya know, that's my 2cents. So, has Instrumental #1 not surfaced yet, taken from this promo CD? Ah wow, where did you find that? Oh, thanks! I had no idea. I really don't - can't - consider it accidental. I feel quite sure that it's a deliberate layering. The buried track has always sounded like "Send His Love to Me". The percussion sounds the same. If that's what I think it is, it appears what "Instrumental #1" is a variation of "Nina in Ecstasy"s melody with a slight drum machine. That's pretty much my conclusion, too. And since that's a topic about B-Sides and our conclusions, I want to talk about "The Northwood" ("A Perfect Day, Elise" single, CD2): the male vocals on there sound exactly like Nick Cave to me. 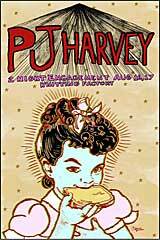 Now, "discogs.com" says that male vocals are by some "James Lynch", and also it says that this song is the only thing he ever done (http://www.discogs.com/PJ-Harvey-A-Perfect-Day-Elise/release/1005687). Kinda suspicious, don't you think? My guess is that Polly Jean and Cave recorded this while they were dating, but later, in 1998, she wasn't sure if she could release the full song without his permission or something, so she made up this name, and made this "sample" (that is, of course, assuming what THERE IS a longer version, and it should). The fact what right after "The Northwood" there goes "Sweeter Than Anything" makes even more sense of all of that to me (this song is also about their relationships IMO). "Now he talks in his sleep, says I (Polly) have never known peace," – that's probably about Cave's interviews ("She's no woman, she's a freak of nature! One big trip", or "She only went out with me because I was famous"). "And I don’t know him now, he's a stranger to me". And, as I know, a lot of fans also think what "No Girl So Sweet" is about them, too, which once again makes even more sense in context with my previous conclusion / speculation (probably, "sweet / sweetness" was some sort of their "little secret word" to refer to their relationships). the male vocals on there sound exactly like Nick Cave to me. To me it always sounded as her own voice with an octave lower effect. After listening the song again, I'm pretty sure it's her voice, especially by the way words are pronounced (check out the open vowels in "...becAUse a fire...", the hissing S in "wasssin my head") and also by the scale progression, it sounds almost as if the male parts are actually the same female part with an octave lower effect. I'm going to try adding an octave higher effect to the male vocals, sounds about two octaves different. The first part of the song, I didn't manage to find the right pitch balance to recognize her voice, maybe it was also stretched and slowed a bit. Don't know what to say about that James Lynch liner note. Maybe the male vocals are actually a combination of her pitch-lowered voice and his, but to me it sounds like her from the beginning to the end of the track.